Jiva Goswami (Sanskrit: जीव गोस्वामी, Jīva Gosvāmī; c. 1513 – 1598) was a Hindu philosopher and saint from the Gaudiya Vaishnava school of Vedanta tradition, producing a great number of philosophical works on the theology and practice of Bhakti yoga, Vaishnava Vedanta and associated disciplines. He was a member of Six Goswamis of Vrindavan, being the nephew of the two leading figures, Rupa Goswami and Sanatana Goswami. There seems to be some controversy amongst biographers about Jiva Goswami's birth. Some opine that he lived from 1511–1596 CE, while others claim that he lived from 1533 to 1618 CE. Not much is known about Jiva Goswami's childhood. He was born in Ramakeli in the district of Maldah, West Bengal as the son of Srivallabha Mallika (also known as Anupama), the younger brother of Rupa and Sanatana; his mother's name is unknown. He had a strong affinity to the worship of Krishna even from his childhood and excelled in his education completing his studies in Sanskrit Vyakarana (grammar) and Kavya (poetics) within a very short period. When Jiva was three or four years old, his uncles resigned from their ministerial posts at the court of Alauddin Hussein Shah (ruled 1493–1519 CE) after their initial meeting with Chaitanya Mahaprabhu (1486–1534 CE) and they decided to join his ranks as mendicants. Jiva's father, Anupama, also met with Chaitanya at this time and followed in the footsteps of his elder brothers and proceeded to travel with Rupa to Vrindavana. Hearing that his father and uncles had made their decision to work in the service of Chaitanya Mahaprabhu, the young Jiva desired to join them also. According to the biographical work Bhakti Ratnakara of Narahari Chakravarti, Jiva had a dream of Chaitanya at this time. This gave him the impetus to leave home and join Rupa and Sanatana. It is unclear from his biographies whether or not Jiva actually ever met Chaitanya personally. Jiva travelled to Navadvipa in West Bengal and met with Nityananda Rama, one of the foremost followers of Chaitanya mahaprabhu. Nityananda took Jiva to all the holy places in Navadvipa and they circumambulated the entire area together. This marked the beginning of the Gaudiya tradition of Navadvipa parikrama (circumambulation of the nine sections of Navadvipa). After the pilgrimage, Nityananda gave his blessings for the young Jiva to proceed towards Vrindavana. Jiva went on to Benares where he studied for some time under the tutelage of Madhusudana Vachaspati, the disciple of the famous logician and Vedantist, Sarvabhauma Bhattacharya. Under Vachaspati, Jiva mastered the six systems of Indian philosophy known as Sad Darsana. In 1535 Jiva arrived in Vrindavana where he remained under the tutelage of his uncles, Rupa and Sanatana (by this time his father Anupama had died). He accepted initiation from Rupa Goswami and was taught the esoteric principles of devotion to Krishna. Jiva helped to edit the writings of Rupa and Sanatana and assisted them in their work in propagating Gaudiya Vaishnavism and excavating the lost holy places of Vrindavana. After the passing of Rupa and Sanatana, Jiva Goswami became the foremost authority in the Gaudiya Vaishnava line. In 1542 Jiva established one of the prominent and important temples in the Vrindavana area, the Radha Damodara mandir, installing deities of Radha and Krishna that had been personally carved by Rupa Goswami. At that time he also established the Vishva Vaishnava Raja Sabha (World Vaishnava Association) and the Rupanuga Vidyapitha, an educational facility for Gaudiya Vaishnavas to study the works of Rupa and Sanatana. His erudition and spirituality were so famous that the Moghul emperor Akbar became his ardent admirer and donated paper for his writing. In 1558, Jiva instructed his students, Narottama Dasa, Srinivasa Acarya and Shyamananda, to go to Bengal and propagate the Gaudiya Vaishnava philosophy and to take with them the original manuscripts that had been written by Rupa and Sanatana. It was in his Sarva-samvadini commentary to the Sat Sandarbhas of Hindu philosophy that Jiva Goswami first wrote of Achintya Bheda Abheda, the philosophy of Chaitanya Mahaprabhu. In essence, the philosophy of Achintya bheda abheda, or "inconceivable oneness and difference", avoids the extremes of Shankara's monistic Advaita vedanta and Madhva's pure dualism (Dvaita) by interpreting the material and spiritual potencies of the Supreme Person (Bhagavan) as being simultaneously one and different with Him. Hari-namamrta-vyakarana: This work is a book on Sanskrit grammar wherein each and every word, syllable and grammatical rule is explained in relation to Krishna and his pastimes. Sutra-malika: A grammatical work dealing with the derivation of Sanskrit words. Rasamrita-sesa: A work dealing with Sanskrit composition. Jiva has based this work on the Sahitya Darpana of Viswanatha Kaviraja, but has used many examples of his own as well as examples from other Goswamis. Madhava-mahotsava: A work describing the coronation ceremony of Radha when she is given the position of Queen of Vrindavana. Sankalpa-kalpadruma:An explanation of the eightfold daily pastimes of Radha and Krishna (asta-kaliya-lila) in the form of a prayer. Gopala Virudavali: A short poem by Jiva extolling the glories of Gopala (Krishna) in 38 verses. Sukha-Bodhini:A commentary on the Gopala Tapani Upanishad, which has importance in Gaudiya Vaishnavism, as it provides Upanishadic backing for the notion that Krishna is the supreme deity. Dig-Darshini Tika on Brahma Samhita: This is Sri Jiva Gosvami's commentary on the text Brahma Samhita, which was discovered by Chaitanya Mahaprabhu at the Adi Kesava Temple at Tiruvattaru. Commentary on Bhakti-rasamrita-sindhu: Jiva Goswami wrote his Durgama-sangamani commentary on Rupa Goswami's Bhakti-rasamrita-sindhu. Agni Puranastha gayatri-bhasya: A commentary on the Brahma Gayatri mantra as found in the ancient Agni Purana, chapters 216–217. Padma Puranokta Krishna-pada-padma-chihna: This text by Jiva describes the insignia found on the feet of Krishna according to the text of the Padma Purana. Sri Radhika-kara-pada-sthita-chihna: In this short work, Jiva Goswami describes the insignia found on the hands and feet of Radha. Laghu Vaishnava Toshani: The Laghu Vaisnava Toshani is Jiva Goswami's commentary to the 10th Canto of Bhagavata Purana. Gopala-Champu: The Gopala-champu is a poetic work written by Jiva and is divided into two parts. The first part is the Purva-champu, which has 33 chapters and describes Krishna's life in Vrindavana. The second section, the Uttara-champu has 37 chapters and describes the pastimes of Krishna after he leaves Vrindavana and the separation the residents of Vrindavana feel in his absence. Tattva-Sandarbha: Tattva sandarbha is a treatise on the various types of evidences (pramanas) used in Vedic philosophy. Jiva's conclusion is that shabd (divine sound in the form of the Vedic scriptures) is the highest, and of all the scriptures, the Bhagavata Purana is the highest. Bhagavat Sandarbha: In the Bhagavat-sandarbha, Jiva Goswami makes the distinction between the impersonal aspect of Godhead (Brahman), the localised form of God within the heart of each living being (Paramatma) and the highest personal aspect of Godhead (Krishna or Bhagavan). He also describes the spiritual realm of Krishna, the modes of material nature, the mode of pure goodness (visuddha-sattva), the importance of worshipping the deity of Krishna and the nature and qualities of the deity. Paramatma Sandarbha: The Paramatma Sandarbha descrives the characteristics of the Paramatma(the supersoul), and how he resides in all living entities in the universe. 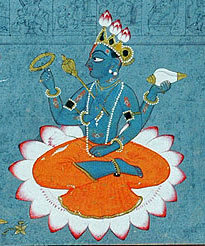 This work also discusses the nature of the materially conditioned living entinites, the phenomenal material world, the illusory potency(Maya), the theory of transformation, the various avataras of Krishna, how Krishna reciprocates with his devotees and how Krishna is characterised by six particular opulences. Krishna Sandarbha: In his Krishna-sandarbha, Jiva gives a number of quotes from various scriptures to prove that Krishna is the supreme god. He also discusses the pastimes and qualities of Krishna as well as his avatars and functionary expansions. There is a description of Goloka, the planet of Krishna in relation to Vrindavana in the material sphere, the associates of Krishna and their expansions and there is also a description of the Gopis and the topmost position of Radha amongst them. Bhakti Sandarbha: Bhakti-sandarbha explains how devotion to Krishna is executed. It also discusses Varnashrama dharma (the socioreligious system established in scriptures), the superexcellent position of devotion to Krishna as compared to other conceptions such as yoga, and the worship of minor deities of the Hindu pantheon as being futile in comparison to the worship of Krishna's devotees. The text also explains liberation of the soul, the position of Shiva as a devotee of Krishna, how unmotivated devotion to Krishna promotes a devotee to the highest spiritual position and numerous other points concerning the performance of Vaishnava devotion. Priti Sandarbha: The Priti-sandarbha is a treatise on divine love, the supreme object being Krishna. Love for God (prema) is considered by Jiva to be the highest form of liberation. Jiva goes on to make a comparative study of other types of liberation but finally concludes that Prema Bhakti is topmost. There is also a discussion on how to attain Prema, how to awaken it, and the symptoms of one who has attained it. Priti-sandarbha also discusses the distinctions between mundane lust and divine love, the various mellows found amongst the associates of Krishna, the superexcellence of Madhurya-rasa (divine conjugal love), the overlapping of different rasas, and the glories of Radha. Krama Sandarbha: The Krama-sandarbha is a commentary on the Bhagavata Purana. Sarva-Samvadini: A commentary on the Sat-Sandarbha. Jiva Goswami left this mortal world and ascended back to the spiritual planet , Golok Vrindavana in 1596 CE (or 1618 according to some biographies). His samādhi (tomb) is located in the precincts of the Radha-Damodara temple in Vrindavana. According to followers of Gaudiya Vaishnavism, Jiva Goswami is considered to be the incarnation of Vilasa Manjari, an eternal maidservant of Radharani. ^ Das Thakur, Narahari. Bhakti Ratnakara. Ras Bihari Lal & Sons. ISBN 9788184030006. ^ Das Adhikari, Puru. "Srila Jiva Goswami". Bhaktivedanta Memorial Library. Retrieved 18 May 2013. ^ Narasingha, Swami B.G. "Sri Damodara Katha" (PDF). Gosai.com. Gosai Publishers. This page was last edited on 3 January 2019, at 12:05 (UTC).